The LNER class A4 locomotives were designed by Sir Nigel Gresley for use on the top-link expresses on the East Coast Main Line from London Kings Cross. Thirty-five of these locomotives were built the LNER at Doncaster works between 1935-38. Haymarket depot (64B) had and allocation of seven A4s, the remainder were based at King's Cross (34A) and Gateshead (52A). The A4s were displaced from the ECML by Class 55 and Class 47 diesels in 1962/63. Some of the class survived a few years longer after moving to Aberdeen Ferryhill and Glasgow St. Rollox sheds, working the '3 hour Expresses' on the Aberdeen - Glasgow Buchanan St. route. In May 1962 Haymarket locos 60004/09/11 went to Ferryhill (61B), and 60027/31 went to St Rollox (65B). During 1963 some of the redundant A4s from the English depots moved north for storage. When these locos had been returned to traffic, the summer of 1964 saw 14 A4s working in Scotland. Loco 60024, and later 60027, were allocated to Edinburgh St Margarets shed (64A) for a time. The last two A4s working for BR were 60019 Bittern (3rd September 1966), and 60024 Kingfisher (14th September 1966). 60019 was bought privately and continued to be used on main line excursions for the next 2 years. Six of the A4 class locos were preserved, although 2 of these are static museum exibits in North America. After withdrawal from Ferryhill depot in 1966, this loco was bought by John Cameron and taken to Lochty in Fife. From 1968 it ran on the 1.5 mile Lochty private railway, until 1973 when it returned to on the main line. After a short period in the goods shed at Kirkcaldy it went to Markinch Goods shed where it stayed until 1990 when it went to Thornton (but not the shed it is at now). It stayed at Thornton for about a year before going back to Markinch. 60009 ran with the name Osprey from March 1990 to September 1991. In 1994 60009 left its base in Scotland moving to Bridgnorth on the Severn Valley Railway. The locomotive returned to Fife in 2007, now based at Thornton Junction shed, where it is closer to the home of its owner. In April 2007, 60009 was used on the Great Britain rail tour for the legs between Glasgow and Inverness, assisted by K4 61994 north of Perth. However after only a month at its new home, 60009 went south and spent the remainder of 2007 working trains in England, in particular the Scarborough Spa Express trains from York. 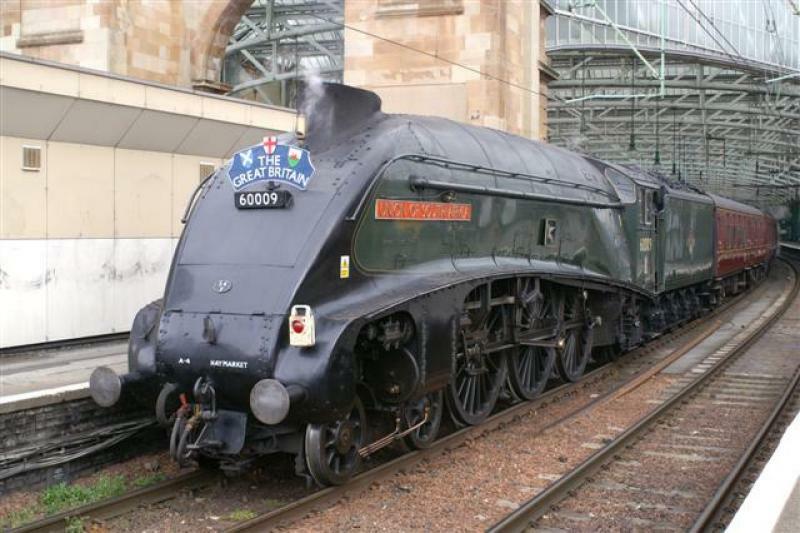 In 2008 Union of South Africa was used on the Great Britain II tour, again to Inverness, this time assisted by a black 5. The loco was also used on several Heart of Midlothian tours on the East Coast Main Line, unfortunately it failed twice on Northbound runs. 2009 saw more some more successful runs on the ECML, a SRPS tour to Inverness and finally a couple of circuits on the Forth Circle via Alloa on 23 of August. with the intention of hauling a number of tours in England, however it developed superheater problems and was unable be used. It remained at Crewe, and with it's 10 year boiler certificate expiring, work has commenced there on a major overhaul. Created by Dysgraphyk and last modified by him at 01:30, 23 of December 2010.